I am so great to hear that Germany closed 60km of one of the busiest highways for a full day to give that space to the people. People came walking, riding bikes or skating to enjoy a day outside. The different community clubs set up different activities. And there were 20000 beer tables set up for people to sit and enjoy along the longest table. 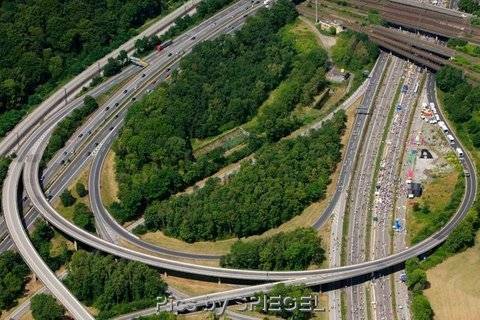 Here are some pictures from Spiegel where I really love the people just doing a great bike ride on the highway. One of Germany’s busiest motorways has been brought to a standstill after a huge party saw picnic tables line 60km (37 miles) of the country’s famous autobahn network. 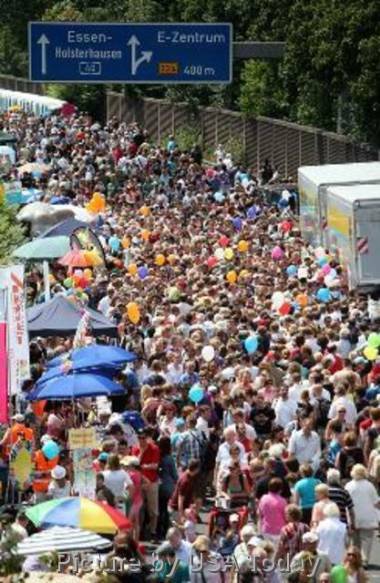 As many as three million people turned up for a giant banquet on one of the busiest stretches of the network between Duisburg and Dortmund, in western Germany. The cultural celebration called rather appropriately Still Life was held in celebration of the Ruhr region. The event’s organisers said they had given away 20,000 tables so people could eat, drink, dance and perform plays into the evening. 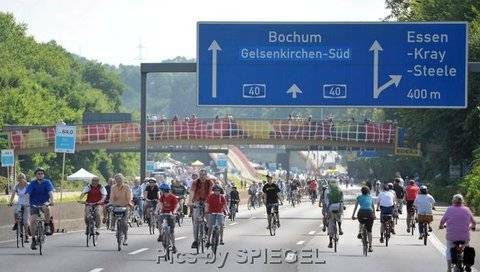 One lane of the autobahn, which crosses North Rhine-Westphalia state, was kept free for skaters and cyclists – and more than one million revellers brought bicycles, including the state premier, Hannelore Kraft. There are no general speed limits on Germany’s autobahns. Cars often speed up to 200km per hour (125mph) or more. In dense or dangerous areas, drivers are often required to slow down to 120 km per hour (75mph). The Ruhr region was chosen by the European Union this year as a European Capital of Culture 2010 the first time the distinction went to an area rather than a city. This entry was posted on Montag, Juli 19th, 2010 at 16:28 and is filed under Cycling, Germany, Green. You can follow any responses to this entry through the RSS 2.0 feed. Both comments and pings are currently closed.